GroupyCompany, the unique, dual audio transmission system for „behind-the-scenes adventure tours“ in companies – available now at Timac Agro in Austria. 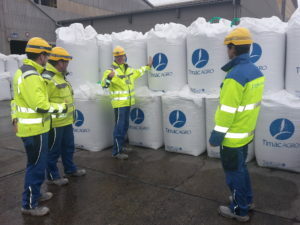 Timac Agro Austria produces and trades granulated and liquid fertilizers as well as feed supplements. The plant in Pischelsdorf (Lower Austria) produces granulated fertilizers for sale on the Austrian and Eastern Europe market. Selected customers, interested pupils and students as well as various stakeholders of the company can experience special factory tours along the production facilities. Since December 2017, GroupyCompany facilitates communication in the sometimes rather loud production environment, e.g. directly in front of the granulator. Future plans include using the special dual function of the device. More detailed explanations (previously saved content) can be transferred to the device in any number of languages and played back using at selected locations. 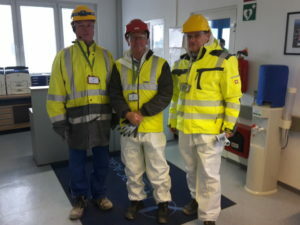 Therefore, internationally mixed factory tours in languages other than German and English will also be possible. We are very happy about this exciting project and our great reference customer Timac Agro! Get more infos about GroupyCompany here!